This is a speech I gave on 17th oct in the Lords in response to an All Party Parliamentary Group report on the lack of progress in drugs policy. “I thank Baroness Meacher very much for proposing this debate and particularly for being so encouraging about participating in it. I have two areas of experience I hope are relevant. I have been a funder and trustee of several charities that deal with the fall out from drugs – these include reprieve, into university and storybook dads. My involvement has also made me think about the impact of the internet on this issue which as some noble lords may know is my particular interest. One charity I know well, just for kids law, JFK, provides invaluable support for children and young people many of whom are in care, looked after or at risk of exclusion from school. As well as legal help they offer services ranging from securing housing to finding work. The organisation is a vital resource for the most vulnerable members of our society. One of the most distressing and relentless aspects of the lives of the children that jfk helps is stop and search by police. We know from police statistics that 50% of all searches are to look for drugs. We also know from police data that the searches take place disapproportionately amongst the BME population. Some JFK clients talk of being stopped more than three times a day. Not only is this destructive to the lives of the children but it is hugely expensive. Jfk worked with another not for profit organisation, stopwatch.org who produced a smartphone app that allowed the kids to register every time they were stopped, whether there was an arrest and how the police treated them. The stopandsearch app allowed young people to get some control over what they felt was persecution – it also showed the high number of searches that did not result in any substances found – Data that could be very useful to the police when prioritising work. It is interesting to refelect on this development – technology is changing the relationship with great speed between the supposed criminal and the authorities. But couldn’t we be even bolder in thinking about how the internet could inform some of the solutions for the enormity of the challenges facing drugs policy makers? It feels as though those currently illegally controlling the drugs industry certainly are. Only yesterday on the r4today Programme there was a discussion on the increasingly high level of their technology capability. Marc goodman, an ex officer who now studies crime and terrorism says in his TED talk in 2012 “All the drug dealers and gang members with whom I dealt had [a cell phone] long before any police officer I knew did”. He also talks about how hard it is for the police to stay ahead of drug cartels – for example in Mexico there is a national encrypted radio station and telecoms network run by a group of dealers that is completely out of the reach of any state. I think it might be even harder to access remotely than the parliamentary email system. The internet is also rapidly changing consumer behaviour and this brings me to the silk road. But my noble lords this is not the beautiful route stretching through central asia well trodden by marco polo – this is the website of the same name mentioned earlier by the noble lord Howarth, sometimes called the amazon.com of drugs. Launched in 2011 the site was operated on Tor, a “dark web” service that anonymises users, making it much more difficult for them to be tracked. 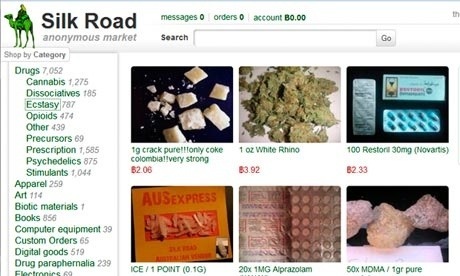 The site allowed users to buy a huge range of semi legal and illegal substances using the digital currency Bitcoin. TheFBI closed it down last month. Rather than a terrible crime, using Silk Road could be seen as a better approach to drug sales, a more peaceful alterative to the deadly violence that street drug deals have led to for decades and as the appg report’s notes show has led to many thousands of deaths and unbelievable cost. As many of commentators have written, the site was credited by its creators and users as mitigating gangs and cartels, providing quality drugs and going someway to breaking dependency cycles. It did this by breaking people’s relationships with dealers on the street and with the police – all objectives of the unsuccessful so called war on drugs that as we know has cost governments around the world trillions of pounds.